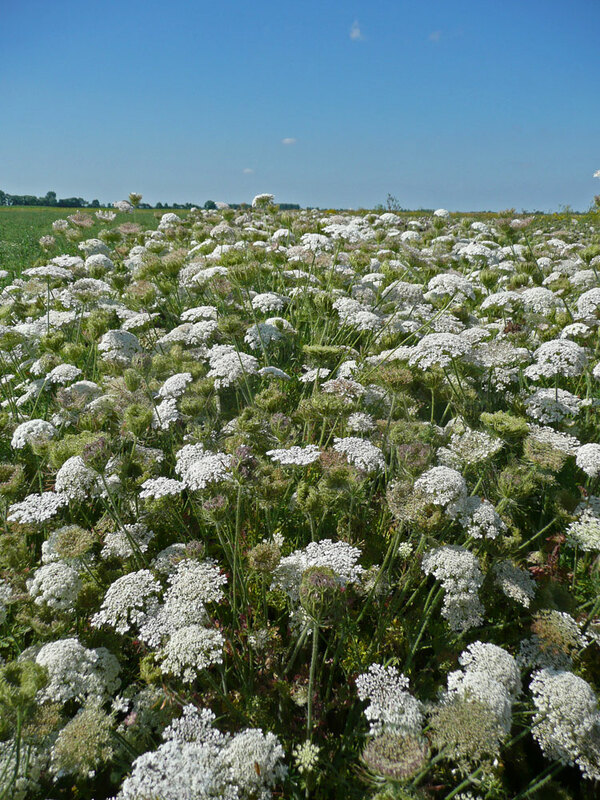 Wild carrot is a member of the family once named Umbelliferae - so called because their flowers are arranged into a flat umbrella-like head or umbel (the modern name of Apiaceae refers to the Greek for celery). Carrot can be identified from other common members of this family because the bracts fringing the umbel are three forked. 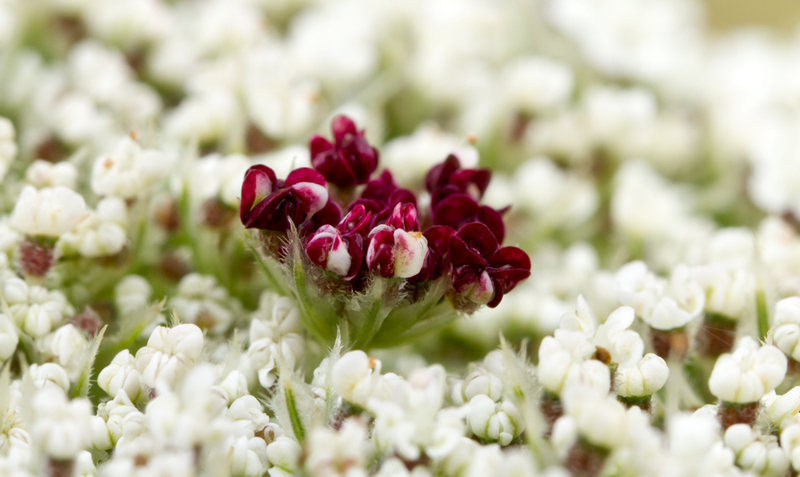 Wild carrot flowers from June to September, most flowers being off white but quite often with a small central group or a single central flower of a dark red. Once flowered the umbel folds inward, clearly showing the forked bracts, and the developing head of seed becomes concave. The whole structure has a distinctive ‘bird’s nest’ appearance which can be present throughout winter. 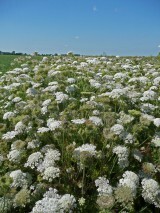 A tall biennial of fairly infertile, free draining and usually calcareous soils, the long stout tap root of Wild carrot allows it to exploit drier environments. It does not cope well with late summer cutting and the young shoots are vulnerable to grazing; consequently it does best on short turf or open sites in ungrazed or lightly grazed pasture but can also be found in rough grassland, roadsides and waste land. Regeneration is entirely by seed which, being flattened and ridged with spines, is dispersed locally by the wind and over greater distances by being caught in the fur of animals. 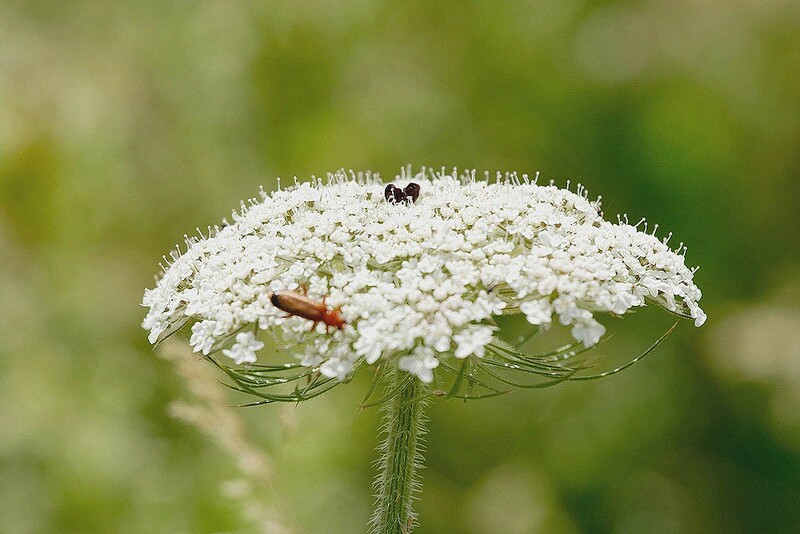 Wild carrot is attractive to a wide variety of specialized pollen and nectar feeding insects such as bees, hoverflies and beetles. Seed dormancy is broken by a period of chilling therefore it is best sown in the autumn.